In the much-discussed Pew poll reporting the spike in ignorance, those who believe Obama to be Muslim say they got their information from the media. But no reputable news agency — that is, fact-based, one that corrects its errors quickly — has spread such inaccuracies. So where is this “media?” Two sources, and they are — no surprise here — the usual suspects. The first, of course, is Rush Limbaugh, who claims the largest radio audience in the land among the microphone demagogues, and his word is Biblical among Republicans. …. [Second], there is Fox News, whose parent company has given $1 million to Republican causes this year but still masquerades as a legitimate source of news. Their chat and opinion programs spread innuendo daily. The founder of Politifact, another nonpartisan referee to the daily rumble, said two of the site’s five most popular items on its Truth-o-meter are corrections of Glenn Beck. I don’t really have anything original to say about this. 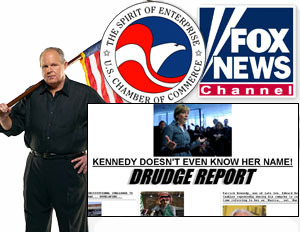 At some point, the much maligned mainstream media is simply going to have to stop reacting to every outrage ginned up by the likes of Limbaugh and Fox as if it’s a straight news story. They don’t react that way to Keith Olbermann or Michael Moore, after all. But I’m not sure how to make that happen. There’s really no excuse for repeatedly getting sucked down the same rabbit hole over and over and over — Megyn Kelly on the New Black Panthers, Breitbart on Shirley Sherrod, Limbaugh on Obama the Muslim, Hannity on the Park51 mosque — but they do anyway. They just can’t seem to help themselves. What’s the answer? As long as they play the game, is it any wonder that so many Americans are misinformed?